BACKGROUND: The aim of this study was to explore epilepsy-related mechanism so as to figure out the possible targets for epilepsy treatment. 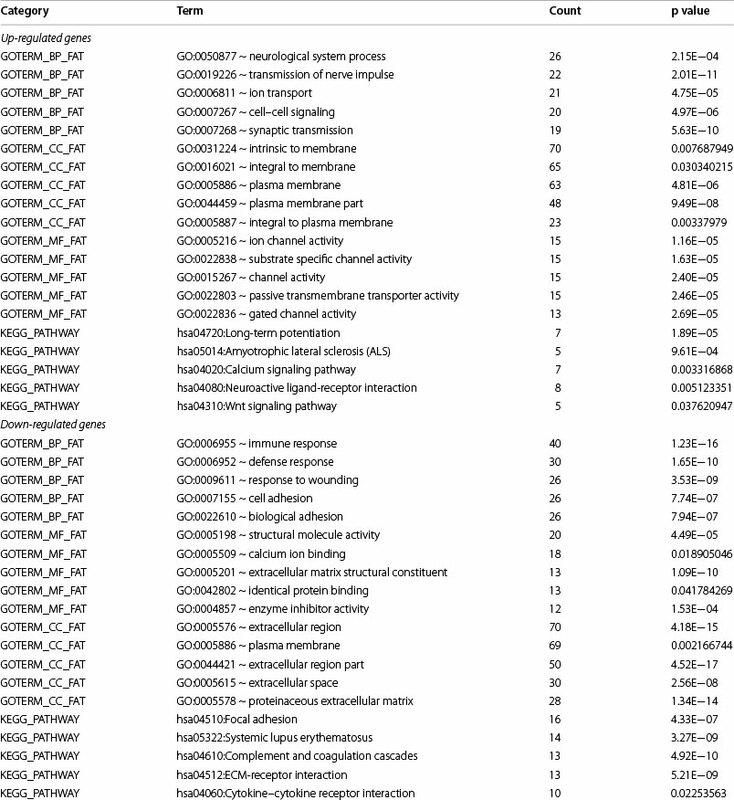 METHODS: The gene expression profile dataset GES32534 was downloaded from Gene Expression Omnibus database. 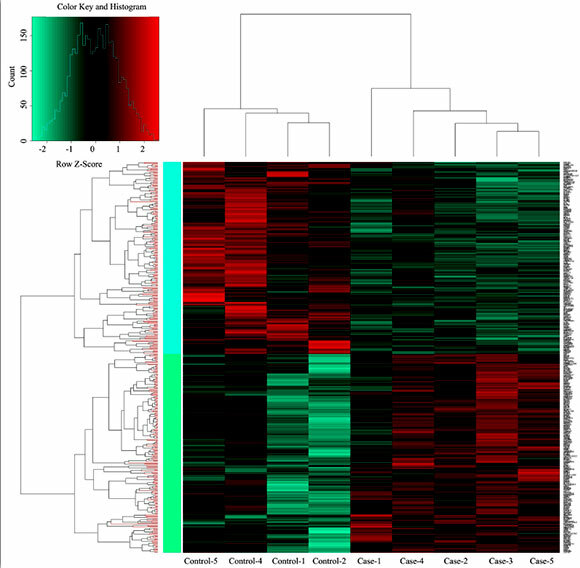 We identified the differentially expressed genes (DEGs) by Affy package. Then the DEGs were used to perform gene ontology (GO) and pathway enrichment analyses. Furthermore, a protein-protein interaction (PPI) network was constructed with the DEGs followed by co-expression modules construction and analysis. RESULTS: Total 420 DEGs were screened out, including 214 up-regulated and 206 down-regulated genes. Functional enrichment analysis revealed that down-regulated genes were mainly involved in the process of immunity regulation and biological repairing process while up-regulated genes were closely related to transporter activity. 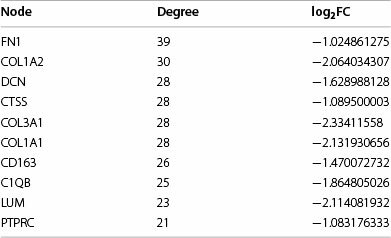 PPI network analysis showed the top ten genes with high degrees were all down-regulated, among which FN1 had the highest degree. The up-regulated and down-regulated DEGs in the PPI network generated two obvious sub-co-expression modules, respectively. In up-co-expression module, SCN3B (sodium channel, voltage gated, type III beta subunit) was enriched in GO:0006814 ~ sodium ion transport. In down-co-expression module, C1QB (complement C1s), CIS (complement component 1, S subcomponent) and CFI (complement factor I) were enriched in GO:0006955 ~ immune response. CONCLUSION: The immune response and complement system play a major role in the pathogenesis of epilepsy. Additionally, C1QB, C1S, CFI, SCN3B and FN1 may be potential therapeutic targets for epilepsy. reported that there are approximately one million people diagnosed with seizure or epilepsy in an emergency department annually in the United States . Patients with epilepsy or seizure often present decreased level of consciousness and disorder to response to environment. Therefore, better understanding of the mechanisms underlying alteration of consciousness in epilepsy is important for the treatment of patients with epilepsy . Currently, the pathogenesis of epilepsy has been widely investigated. Epilepsy may develop from the up-regulated excitatory circuits or down-regulated excitatory due to brain injury . A previous study indicated that a loss of glutamine synthetase was the direct factor for high level of extracellular glutamate that played a key role in the occurrence of epileptic seizures . Turrin et al. suggested a different mechanism related with pro-inflammatory expression in regulating the innate immune reaction in response to seizures, which gave a new perspective for epilepsy related neuropathology. Furthermore, it is reported that specific inflammatory pathways are chronically activated during epileptogenesis and persist in chronic epileptic tissue, suggesting they may contribute to the etiopathogenesis of temporal lobe epilepsy . However, current studies for genetic mechanism underlying epilepsy has not been clearly defined. Besides, there are not enough epilepsy related candidate genes which can be used as treatment targets. In the present study, we investigated the global gene expression profile GSE32534, which was supplied by Niesen et al. . Additionally, He et al. used this expression profile to perform gene set enrichment analysis and identified several epilepsy related transcription factors and pathways. However, they did not analyze the protein-protein interaction (PPI) network and co-expression modules associated with epilepsy. PPI and co-expression modules analyses can provide new insights into protein function, besides, they may help to uncover the generic organization principles of functional cellular networks . Therefore, based on the dataset of GSE32534, we firstly identified the differentially expressed genes (DEGs) between healthy and epilepsy specimens. Then, gene ontology (GO) function and Kyoto encyclopedia of genes and genomes (KEGG) pathway analyses were performed on the selected DEGs to explore the biological roles of these DEGs. Finally, we constructed and analyzed PPI network and co-expression modules. We aimed to further explore the molecular mechanism underlying epilepsy and explore novel gene targets for epilepsy therapy. The epilepsy related dataset (accession number: GSE32534) that was contributed by Niesen et al. was downloaded from the Gene Expression Omnibus (GEO, http://www.ncbi.nlm.nih.gov/geo/) based on Affym-etrix Rat Genome U34 Array (Affymetrix Inc., Santa Clara, CA, USA). Data from ten peritumoral cortex tissue specimens were available for further analysis, including five samples from epilepsy and five from non-epilepsy patients with low grade brain tumor. The probe-level data were converted into expression matrix by RMA (function in Affy package) in R language. 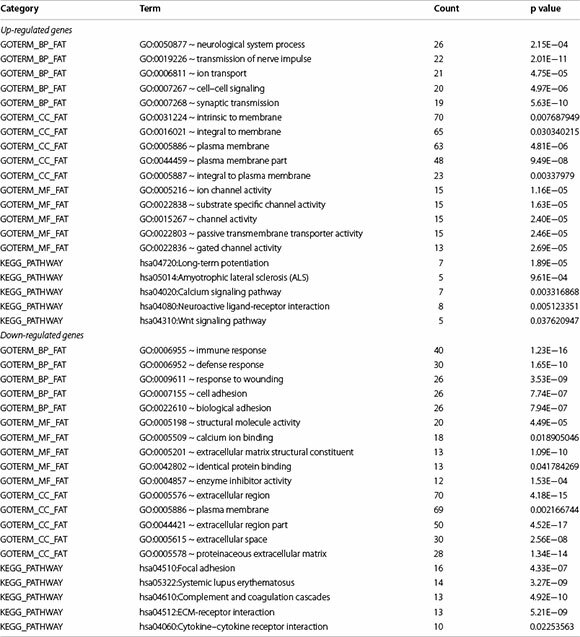 Probe numbers were converted into gene names using Bioconductor annotation function in R language combined with annotation information in microarray platform GPL570 (HG-U133_Plus_2). The expression values of multiple probes for a given gene were reduced to a single value by taking the average expression value. After the expression data were normalized , the DEGs (epilepsy vs. non-epilepsy) were identified by Limma package  in R language. Genes with |log2FC (fold change)| > 1 and p < 0.05 were defined as DEGs. Database for annotation, visualization, and integrated discovery (DAVID, http://david.abcc.ncifcrf.gov/) [14, 15], an online tool, consists of an integrated biological knowledgebase and analytic tools aimed at systematically extracting biological meaning from large gene or protein lists . In this study, the GO functional and KEGG pathway enrichment analyses for the screened DEGs was performed by DAVID. The multiple testing correction was performed using Benjamini-Hochberg (HB) method , and fold discovery rate (FDR) <0.05 was chosen as the cut-off criterion. Search tool for the retrieval of interacting genes/proteins (STRING, http://string-db.org/)  was used to construct protein-protein interaction network among DEGs. 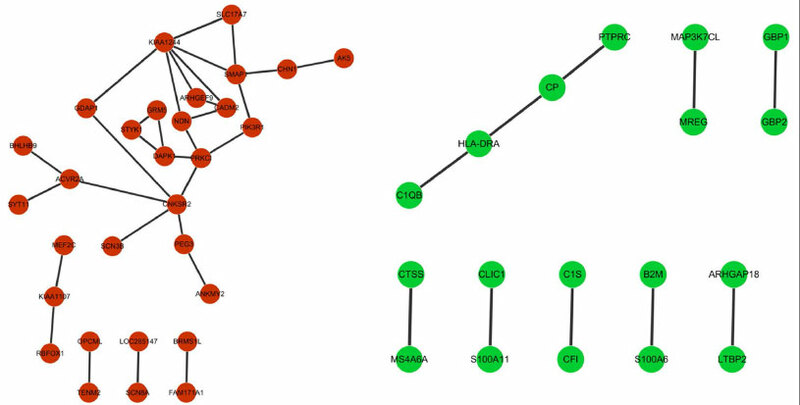 Genes with correlation coefficient higher than 0.7 were mapped to PPI network, which was visualized by Cytoscape (http://www.cytoscape.org/) . Igraph package in R language was used to calculate the connectivity degree of each node. Expression similarity coefficient was calculated to select co-expression genes among DEGs. The co-expression module was constructed by the DEGs with expression similarity coefficient >0.99 and p < 0.001. GO and KEGG pathway enrichment analyses were performed for modular genes using the DAVID online tool. After preprocessing, we obtained the expression values of 19,944 genes. The normalization showed a good result on a wide variety of array (Fig. 1). Total 420 DEGs were screened out, including 214 up-regulated and 206 down-regulated genes. 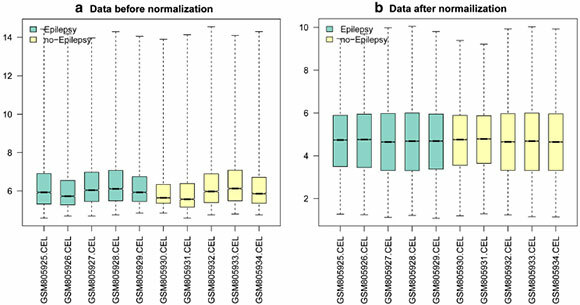 Hierarchical clustering indicated that the DEGs could clearly distinguish epilepsy samples from the normal controls (Fig. 2). The results of GO and KEGG enrichment analyses were displayed in Table 1. The significantly enriched GO terms of up-regulated DEGs were closely associated with cell- cell signaling, synaptic transmission and transmission of nerve impulse. The down-regulated DEGs were significantly enriched in immunity regulation and repairing process of injured tissues. The significant pathway that enriched by up- and down-regulated DEGs was hsa04720:Long-term potentiation and hsa04510:Focal adhesion, respectively. 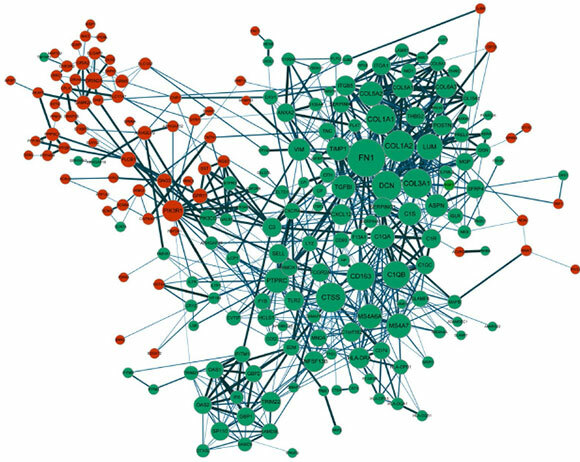 In the PPI network, rare interactions were observed between the up- and the down-regulated genes, while most interactions were observed within the up-regulated genes or the down-regulated genes (Fig. 3). 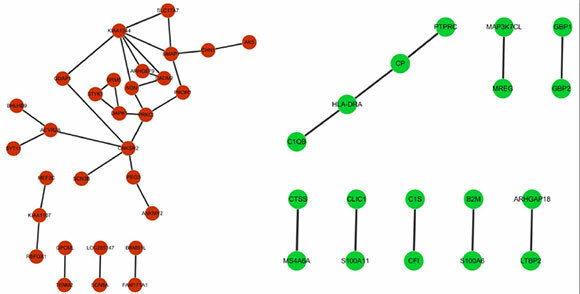 Besides, nodes degree was analyzed for genes in PPI network to obtain the information of hub nodes. Ten DEGs were considered as hub genes, such as FN1 (fibronectin 1), COL1A2 (collagen alpha-2), and C1QB (complement C1s) (Table 2). The co-expression modules were constructed with up-and down-regulated genes, respectively (Fig. 4). As shown in Table 3, obviously enriched GO terms of genes in up-co-expression module were GO:0006814 ~ sodium ion transport, GO:0030695 ~ GTPase regulator activity and GO:0060589 ~ nucleoside-triphosphatase regulator activity. The down-regulated genes in the co-expression modules were mainly associated with immunity regulation and cell damage repairing processes. For instance, SCN3B (sodium channel, voltage gated, type III beta subunit) was enriched in GO:0006814 ~ sodium ion transport. C1QB, C1S (complement component 1, S subcomponent), and CFI (complement factor I) were enriched in GO:0006955 ~ immune response and GO:0050778 ~ positive regulation of immune response. Epilepsy is defined as a chronic brain disorder and its genetic mechanism has not been elucidated clearly, which hampered the development of novel preventive and treatment management. In this study, we explored the molecular mechanism of human epilepsy by using bioinformatics methods and attempted to give a new insight to the design of good therapy. Total 214 up-regulated genes and 206 down-regulated DEGs between epilepsy and control group were screened out. According to PPI network analysis, top ten DEGs with high node degrees were all down-regulated. Among them, FN1 showed the highest degree, which was closely associated with cell transport activity. The data of GO analysis showed that the down-regulated DEGs in epilepsy patients were significantly enriched in immune response and defense response related biological processes. Recent evidence has suggested that the innate and adaptive immune reaction is involved in the epilepsy, which was implicated in the inflammatory processes within the brain . It has been proved that the immune system and the nervous system maintain extensive communication . The inflammation of brain contributed to the local neuronal excitability that resulted in seizures . Importantly, several inflammatory mediators, including temporal lobe epilepsy and cortical dysplasia-related epilepsy, have been detected in surgically resected brain tissue from epilepsy patients . Our results further supported that immune response and inflammatory processes might constitute a crucial mechanism in the pathophysiology of epilepsy. 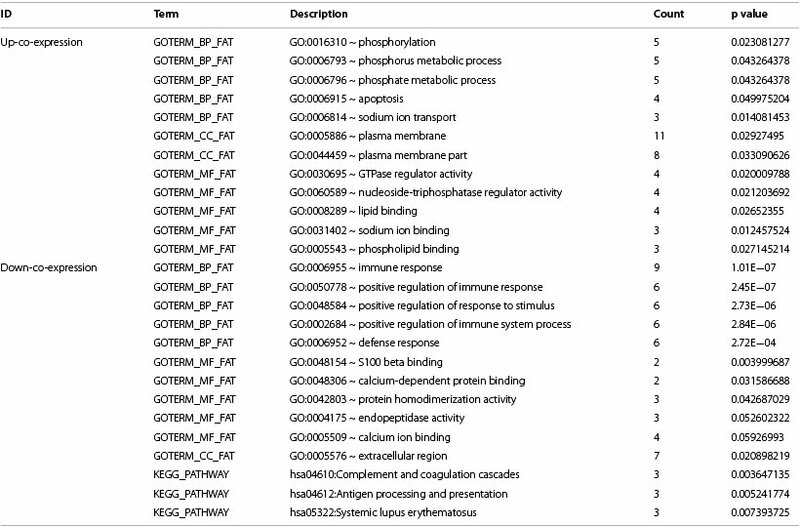 Specially, in our study, several DEGs were found significantly enriched in immune regulation related terms in the co-expression module, which was consistent with the results of GO functional analysis. These DEGs included C1QB, CIS, CFI, PTPRC, HLA-DRA and B2M. Previous study has found that the complement system represents an essential effector of both humoral immunity and cellular immunity . Among these DEGs in the co-expression module, C1QB and CIS encoded the subunits of human complement component C1 and play roles in the complement activation pathway. C1 deficiency and impaired activation of the complement classical pathway generally leads to severe immune complex disease . C1QB has been found to be a epilepsy related gene and the expression of C1QB mRNA declines in brain peritu-moral tissues of patients with tumor-induced epilepsy . Besides, expression of various complement components, such as C1q, C3c, and C3d, has been observed in reactive astrocytes within the sclerotic hippocampus of people with temporal lobe epilepsy . Interestingly, protein encoded by CFI is essential for regulating the complement cascade. CFI can inhibit the activation of complements by the inactivation of C3b and C4b and the normal combination of C3 and C5. The persistence of complement activation could contribute to a sustained inflammatory response and could destabilize neuronal networks . Thus, the down-regulation of CFI may promote the activation of complements to accelerate the progression of epilepsy. Importantly, CFI has significant interconnectivity with C1S in this paper. Besides, CFI, C1S and C1QB jointly enriched in the complement activation pathway according to the results of GO and pathway enrichment analysis. Taken together, we proposed that complement system might play key roles in the development of epilepsy by dysregulating the expression of C1QB, CIS and CFI. In addition to down-co-expression module, in the up-co-expression module, SCN3B was found enriched in GO terms related to sodium ion transport. The rapid and selective transport of sodium ion through sodium channels is essential for initiating action potentials within excitable cells . Study has found that changes in the function of many ion channels, including sodium channels, contribute to the epileptogenesis . Baek et al. reported that voltage-gated sodium channels could initiate action potentials in brain neurons, and mutation of the channels was associated with several forms of inherited epilepsy. Importantly, SCN3B, an enriched DEGs of this term, is demonstrated to encode voltage-gated sodium channels. In adult brain, there are four accessory β subunits, including SCN1B, SCN2B, SCN3B and SCN4B. The β subunits are thought to affect trafficking and gating of the voltage-gated sodium channels . Therefore, we speculated that SCN3B might play an important role in the progression of epilepsy through sodium channels. Furthermore, in our study, FN1 was found to have the highest degree in PPI network. FN1 is a multifunctional, extracellular matrix glycoprotein which contains several distinct domains that may bind to cell surfaces. Fibronec-tin has been reported to play a role in cellular morphology, phagocytosis, and wound repair . Moreover, fibronectin was reported to be involved in astroglial proliferation. Previous study revealed that astrocytes play a major role in the regulation of the immune/inflammatory response in several human central nervous system diseases [33, 34]. In epilepsy-associated pathologies, astrocytes in tissues of patients with epilepsy undergo significant changes in their physiological properties . As a result, we can predict that FN1 may be a candidate molecular marker associated with the occurrence and progression of epilepsy patients by affecting the astrocytes. In conclusion, our study provided a comprehensive bioinformatics analysis of DEGs and functions which may be involved in the progression of epilepsy. Immune response, complement system and sodium ion transport may play major roles in the pathogenesis of epilepsy. The dysregulation of C1QB, C1S, CFI, SCN3B and FN1 maybe used potential gene targets for epilepsy treatment. Although there are some novel findings, a lack of experimental evidences is a limitation in our study. Further experimental studies should be conducted to validate our findings in the future. HB: Benjamini-Hochberg; COL1A2: collagen alpha-2; DAVID: database for annotation, visualization, and integrated discovery; DEGs: differentially expressed genes; FDR: fold discovery rate; FN1: fibronectin 1; KEGG: Kyoto encyclopedia of genes and genomes; GEO: gene expression omnibus; GO: gene ontology; STRING: search tool for the retrieval of interacting genes/ proteins. YJ carried out the molecular studies, CZ participated in the sequence alignment, LC, XL and SP drafted the manuscript. DJ carried out the study. JM participated in the sequence alignment. JL and BW participated in the design of the study and performed the statistical analysis. YJ conceived of the study, and participated in its design and coordination and helped to draft the manuscript. All authors read and approved the final manuscript.